bauhaus imaginista narrates the international histories of the Bauhaus. Since its foundation in 1919, the school was in contact with other avant-garde movements worldwide. 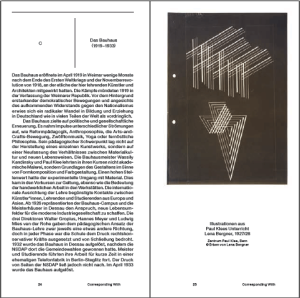 bauhaus imaginista proposes a rereading of the Bauhaus as a cosmopolitan project with global resonances: A major exhibition and two conferences trace transnational relations, correspondences, and narratives of migration, going beyond the years the Bauhaus was active as a school (until 1933). For the first time, the project tracks the translation of Bauhaus concepts into different political and geographical contexts. Since March 2018, exhibitions, symposia, and workshops in Rabat, Hangzhou, New York, Kyoto, and Tokyo, Moscow, Sao Paulo, Lagos, and Delhi have been realized in collaboration with the Goethe-Institutes and local partners. Now bauhaus imaginista culminates with an expanded overview at HKW.